The following is a reply to a friend via email, about the offer of a set from my hometown of Buffalo, NY. It’s something that has been on my mind the last few years, he just provided the opportunity to share it. A long answer to a simple inquiry, please excuse, I thinking out loud here. As tempting a radio set from my old hometown of Buffalo would be, I’m kinda of at radio saturation right now. Still picking up the selected home brew set or rig, National and Gross Radio items, and ocassional parts, but I’m starting the long process of culling the herd. I’m pretty young at 53, and blessed with good health (and a wife who keeps me so), but having helped more than a few friends who have become silent keys deal with the estate, I know first hand what a burden some radio collections can be. All of one’s beloved radio gear, parts, tubes, lovingly curated over a lifetime, sadly so often becomes a burden, and ends up in the dumpster. My own Elmer’s gear, beautifully hand built transmitters, deserving of a place in a museum, suffered that fate. I don’t want to focus on my own mortality, and I know well where I’m going after I pass on, but the fact of the matter is things happen. Working as an EMT in EMS I see that every day. What makes me sad is so many of the young folks today, whom I imagined giving some of my radio gear on to, have zero interest in radio. It’s Facebook, the internet, instant message….I guess can’t fault them, it’s likely the same excitement that you and I had tuning in that shortwave broadcast station late at night, so many years ago. I used to plan to donate all my gear, once friends had first dibs, to the Antique Wireless Association, but lately I’m having second thoughts about that. Not sure they want it, can use it, or if it will even be on display. My other plan to was to offer it some younger local hams, budding radio amateurs, but they seem as scare as hen’s teeth. A few weeks back I read an article in the news about the children of some older folks rejecting the inheritance of their mother’s prized tea cup collection. The essence of it went like this, the mother had spent most of her adult life collecting special tea cups, antique tea cups, painted tea cups, imported tea cups, you name it. The mother, having amassed this collection at great effort and not inconsiderable cost, understandably thought her children would be as delighted with it as an inheritance gift. Turns out the new generation views collections of anything, tea cups, old books, and I guess even radios, as “burdens”. Who knew, guess that explains why younger folks are not as excited about my offer of vintage ham radios. I’ll share with you an analogy that has haunted me for the past few years. I’m reminded of growing up on an old farmstead, complete with barn, farmhouse, and old farm equipment sitting outside. Growing up I vividly recall an old horse drawn plow sitting on hill near the barn. It was next to a stream, by the garden, and as children we played on that plow. As teenagers and adults we watched it dissolve, over the next two decades, into the fields it once plowed. The farmer that spent his hard earned money to buy that plow was undoubtedly quite proud of it, and I’m certain he treasured it, never thinking it would be left to weather the elements. Unfortunately time, and frankly utility of use passed it by, and it was left rust and decay by future generations. Of the millions of plows like that made, our current society only valued a few that were to be placed into museums. 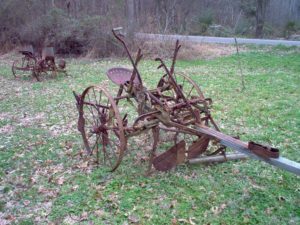 I’ve got to wonder if the story of the old farmer’s plow is to be the fate of my radio collection, of the sets that I and others once prized, chased, and restored with loving care. Sets we operated, and obtained countless hours of joy and satisfaction with and from. Radios that somehow represented a time capsule of our society, a snapshot of a time gone by. I’m currently restoring a National NC-101X, which had been purchased in 1937 lovingly cared for for 75 years by the original owner, but after his passing, the son and grandson had no interest. Nor did they have interest in the impressive collection of old radio and automotive books and parts he had collected over the years, they were placed outside on the lawn to be given or thrown away. In the past I spent nearly a year each restoring a Gross Radio CP-25 transmitter, and another year restoring a home brew TZ40 rig. I can’t begin to count the hours I spent. The parts cost and the powder coating were minimal in comparison to the long, and late hours I spent in the barn documenting, researching, disassembling, and rebuilding those sets. They turned heads, no doubt, won a Matlack Award at the AWA Convention, but other than that, no one is interested in them, the average person on the street would think them “old radio junk”. And after I go onto my reward, I expect they’ll be…well I’m not sure.